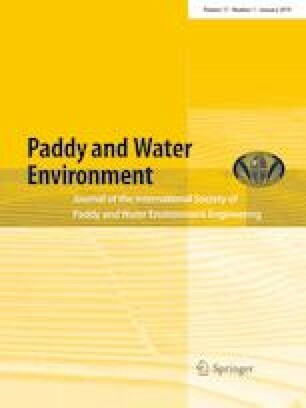 This study aims to investigate a possibility of quantitative assessment of the relationship between return flow from paddy fields and river regime by using hydrogen- and oxygen-isotopic ratios of water (i.e., δD and δ18O). In the Saba River Basin and three caldera lakes (Tamblingan, Buyan, and Bratan) locating near the basin in the north of Bali Island, Indonesia, the δD and δ18O in fresh rainwater, river water, spring water, the surface water of several paddy plots with ponding, and lake surface water were measured from 2012 to 2014. In the middle and the lower areas of this basin, paddy fields are predominant land use. In contrast, in the upper area, plantation and forest are major, while paddy fields are very limited. All the δD–δ18O regression relationships in the upper river water, the spring water, and the fresh rainwater reasonably agreed with the Bali rainwater line (BRL), which is the “meteorological water line” specified for Bali (Kayane in water cycle and water use in Bali Island. Dissertation, Institute of Geoscience, University of Tsukuba, 1992). The regression lines for the paddy surface water [Paddy Line (PL)] and for the caldera lakes water (Lake Line), both of which had high correlation, could be significantly differentiated each other and also from the BRL. Almost all the plotted points of δ18O vs. δD in the middle and the lower river waters containing discharge from paddy fields were located in a range between the BRL and the PL on a δ-diagram. Although further investigations are still needed, we concluded that it is possible to quantitatively assess the relationship between return flow from paddy fields and river regime, algebraically. In addition, according to the same logic, it was assumed with high possibility that the water in Lake Tamblingan adjacent to the Saba River Basin is flowing into the Panas River, which is a branch river of the Saba, beyond the basin boundary. We wish to thank Dr. I Wayan Budiasa and Mr. Ida Bagus Santika for support on hydrological survey in the field. This research work was also supported by the Research Institute for Humanity and Nature (RIHN), “Designing Local Frameworks for Integrated Water Resources Management” Project (C-09-Init).